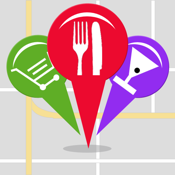 Just start the app and let it find your location and popular places around you. Find a place you like? Just "PinIt." Enter a description, select a category, take a picture, and Save! Next time you're in the area, PinIt will show you all the places you saved. Bring them up, add comments, or simply delete them. You are in control of the places you like. Tell your friends and tell us what you like and don't like. You want more features, tell us!